When it comes to digital marketing, we often put a lot of thought into things like “viral content” and “engagement.” Though these industry buzzwords can be tempting to focus on, the truth is that these elements of digital marketing don’t really tell the whole story. These metrics can’t give you a clear picture of how the time, money, and effort you put into your brand’s digital marketing efforts impacts your company’s bottom line. If you want to better understand how the different moving pieces of your digital marketing campaigns are impacting your business, you need to measure digital marketing ROI. Measuring return on investment is the only way to know for sure if you’re allocating your budget effectively and getting the most out of your marketing spend. Below, we’ll dive deeper into what digital marketing ROI is and how you can measure it for your own business. We’ll also provide a quick list of helpful, actionable tips that you can use to improve your return on investment over time. What is Digital Marketing ROI? Digital marketing ROI is the measure of the profit or loss that you generate on your digital marketing campaigns, based on the amount of money you have invested. What we mean by this is that if you do not measure the success of your campaigns over time, then you won’t know what’s working and what isn’t. And if you don’t measure the ROI of your campaigns, you won’t know for sure if you’re wasting money or spending your digital marketing budget wisely. 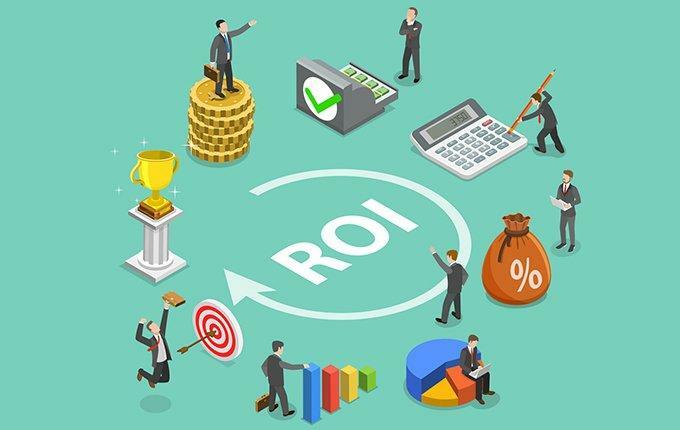 Knowing the ROI of different aspects of your campaigns helps you better understand where you should be allocating your marketing budget for best results. These are just a few of the issues that most organizations site as roadblocks to proving digital marketing ROI. Conversion rate is one of the most popular metrics used to track return on investment over time. If the goal of your marketing campaigns is to convert, then conversion metrics will tell you how well you are accomplishing this goal. This then tells you what you are doing well and where you can allocate your resources for better results and improved return on investment. When it comes to conversion rates, there are a couple of things that you’ll want to look for. One of these is conversion rates by channel. Knowing where your traffic is coming from is only half the battle. You also want to look at which channels are converting the best. If you find that some of your channels convert better than others, then you may want to invest more in these channels to help improve ROI. You should also look at conversion rates by device. If you find that one device has less than stellar conversion performance but high traffic rates, then it’s time to reevaluate your campaigns for that device. For example, mobile often brings in a lot of traffic. But many brands have a difficult time converting mobile users. When you see this trend for your own business, then it’s time to start re-thinking your mobile digital marketing campaigns. If the goal of your digital marketing campaign is to collect new leads for your sales team to close, then you need to measure how much you are paying for each new lead. This will help you determine what your return on investment is for that particular campaign. To calculate cost per lead, divide total ad or campaign spend by the total number of leads attributed to that campaign. If you find that the cost of each lead is more than what you can produce when closing these leads, then you are not getting a positive return on investment. It’s also important to monitor your lead close rate. This is something you may already be doing on your own. But there’s a good chance that this information isn’t being integrated into the online analytics you collect. Keeping an eye on your lead close rate gives you a better idea of how effective you digital marketing campaigns really are, which contributes to your return on investment. Check your lead close rate against the leads that are being generated. This will help you understand how profitable each of your marketing campaigns are. You can also use this information as a benchmark for new digital marketing campaigns. If you find that new campaigns are closing leads at a lower than average rate, it may be time to make some adjustments. Your cost per acquisition tells you how much it costs on average to acquire a new customer. To calculate cost per acquisition, divide your total marketing costs by the number of sales generated. Knowing how much it costs to acquire a new sale helps you better understand your return on investment. If you are spending more to acquire a customer than they actually bring in to your company, you have a negative return on investment. This suggests that you need to revisit your marketing campaigns and find ways to lower your cost per acquisition. Average order value (AOV) is another important metric that can help you better understand your digital marketing ROI. This metric tracks the average dollar amount that’s spent when a customer places an order. To calculate AOV, you’ll divide the total revenue by the number of orders. While every business wants to see the number of orders increase over time, it’s also valuable to pay attention to the average value of each order. Being able to increase the average value of an order by even a small percentage can result in thousands of dollars of new revenue! Improving AOV is often as simple as providing a better user experience or more effectively showcasing up-sell or cross-sell opportunities. Customer lifetime value is a vital measurement for understanding your digital marketing ROI. This metric tells you what the average consumer will spend over their lifetime as a customer. Though initial customer acquisition costs are important, using this metric as well will allow you to get a better understanding of a customer’s overall value. For example, let’s say that it costs you $100 to acquire a customer. And that customer makes an initial purchase of $100. At first glance, this doesn’t provide you with a positive ROI. However, if this same customer spends $100 every month for the foreseeable future, then the initial $100 investment was well worth it. When you look at the long-term profit that you can stand to gain from a customer, it gives you a new perspective on initial acquisition costs and your ROI. Of course, you won’t come out at an initial loss for every first-time customer. But the ability to see beyond their first purchase gives you a more accurate outlook on ROI. Above are some general metrics that you can use to measure the ROI of your marketing campaigns. However, it’s important to note that the metrics you use to measure your campaigns will ultimately depend on which tactics you are using in your campaigns. The metrics that you use to measure email marketing ROI are not the same as those you might use for social media. Remember, the metrics that you use to measure ROI on different marketing channels will depend on your goals and objectives. Email – Open rate, click-through rate, bounce rate, unsubscribe rate, conversions, and leads acquired. Social Media – Engagement rates, clicks and click-through rate, conversions, leads acquired, and new fans or followers. Landing Pages – Traffic, unique visitors, returning visitors, total page views, time spent on page, actions taken, and conversions. Blogs – Traffic, clicks, time spent on page, unique visitors, returning visitors, actions taken, and conversions. When you are comparing your ROI data, you should refrain from comparing the data month to month. Month-to-month comparisons don’t take into account certain abnormalities or things like seasonal demands. Instead, take a look year-over-year comparisons. These will give you a better idea of how your digital marketing campaigns are improving over time. The majority of businesses are not even sure if they’re satisfied with their ROI… probably because they don’t know how to measure it! 1. Clearly identify your goals early on. As we mentioned above in the ROI measurement section, you need to know what the goals of your campaign are before you can begin to measure digital marketing ROI. If your goals are unclear, then there’s a good chance that you might not be using the right metrics to track your ROI. The first step in measuring and improving your digital marketing return on investment is identifying clear goals that allow you to achieve objective results. Avoid vague and loosely defined goals such as “increase awareness” or “create more conversions.” Instead, make sure that your goals are SMART – specific, measurable, achievable, relevant, and time bound. Make sure that all the goals you make for digital marketing are SMART. You can do this by starting with a vague goal and making it SMARTer. For example, let’s say that your goal for a particular campaign is to increase conversions. You need to make sure that this is more specific and measurable. Perhaps – “Convert 20% of leads into customers” is your goal. Then, you need to make sure that this is time bound. So adding a timeline like “in quarter 3” or “in 6 months” ensures you have an objective to complete your goal. As for achievable and relevant, this depends on your particular campaign. Make sure that you are choosing a measurement that’s achievable in the time frame you’ve given yourself. Also, make sure that whatever goal you’ve chosen is relevant to your overall objectives and the digital marketing campaign at hand. Developing SMART goals for each campaign before you implement the tactics is a great way to make sure you’re on the right track for success. Without clearly defined goals in place, you won’t be able to measure your ROI properly. And if you can’t measure ROI then you can’t find ways to improve it. 2. Use KPIs that are directly related to your goals. Once you have clearly defined goals and objectives in place, you need to make sure that you’re choosing KPIs that align with these goals. KPIs, or key performance indicators, are the key metrics or ways that you measure your progress toward these goals. KPIs for SEO will be different than KPIs for email marketing or social. If you don’t have KPIs in place, you have no way of knowing how close you are to reaching these goals. Be sure to keep the following in mind when developing your digital marketing KPIs. Make sure that the KPIs you choose relate to the goals you’ve established. For example, if your goal is to increase conversions, you might use metrics that deal with sales to measure progress toward these conversion goals. By using KPIs to track progress, you’ll be able to see how close you are getting to achieving your goals. KPIs not only help you track progress toward your campaign goals. But they allow you to set clear expectations for your marketing team. With KPIs in place, you can prevent any miscommunication or misunderstanding about what you are trying to achieve. Your marketing team knows exactly how campaign success will be measured so that they can focus on finding ways to improve these metrics. 3. Test different targeting, offers, frequency, and messaging. Testing is a vital part of improving your digital marketing ROI. Not only does it help you improve the performance of individual digital marketing campaigns, but it can also help you discover new insights that can be applied to your broader digital marketing strategy. The only way to know for sure which elements of your digital marketing campaigns are impacting your success is to test them. You can run A/B tests on different aspects of your digital marketing campaigns to see which elements provide better results. From email marketing to social media content to PPC ads, every element of your campaigns can benefit from thorough testing. When you perform an A/B test, you should only choose one element of your campaign to test. For example, if you’re testing a landing page, you might start with the headline. Change the copy for the headline in one test version and keep the other the same. Then, test each one to see which performs the best. When performing an A/B test, only change one element at a time so that you know which variable is impacting performance. Once you know which elements of your campaigns perform best, you can then make strategic changes to both current and future marketing campaigns. And this doesn’t just apply for the same types of campaigns. You can apply changes to different campaigns across channels and tactics. For instance, let’s say that you find a certain type of messaging resonates best with your PPC ads or Facebook ads. You might then not only make changes to your PPC ad messaging, but also carry these changes across to other elements of your digital marketing such as email marketing messages. 4. Identify and seize important opportunities for improvement. It’s not just enough to track your chosen metrics over time. If you really want to improve ROI, you’ve got to adjust your campaigns based on what you find. The data itself is not the most important part of your digital marketing campaign measurements. It’s the vital insights that you gain by looking at an analyzing this data that will help you grow your brand. Once you’ve done some experimenting and have continued to track measurements over time, you will start to notice some trends or areas of opportunity. It’s imperative that you seize these opportunities to improve. Perform new tests based on what you find to continuously find new ways to make your campaigns even better than before. For example, let’s say that you are using conversions by device as one of your metrics. In measuring this metric over time, you find that certain demographics of your population, such as younger age groups, prefer using mobile devices. If you want to improve ROI by boosting conversions on these devices, you might consider tailoring your messaging and offers on mobile campaigns to appeal to this segment of your target population. Some other factors you might look at when analyzing your data and looking for new opportunities is the different channels that you’re using for campaigns as well as the time of day or day of the week that people tend to convert. Keeping an eye on these elements will help you better optimize when you publish content marketing or launch ads as part of your digital marketing campaigns. The only way to improve your digital marketing campaigns is to know where you stand with your current campaign performance. Digital marketing ROI is one of the most accurate ways to measure your campaign success over time. This measurement helps tie campaign success to your overall business bottom line, which is often overlooked when it comes to marketing measurement. It’s important to remember that you need to start with specific and measurable goals before you can begin to measure digital marketing ROI. The metrics that you use to measure return on investment will depend on your goals and the channels you are using to execute on these goals. No matter which channels you use or how you measure ROI, the key to improvement is ongoing measurement and adjustment. Improving your digital marketing ROI can get a bit tricky. With so many moving parts to your digital marketing campaigns, it can be difficult to decide which areas of your campaigns need to be adjusted. Not to mention, dealing with all that data can be overwhelming, especially if you don’t know what you’re looking for. That’s why it can help to get some guidance from a digital marketing agency. If data isn’t your thing or you are just struggling to get the return on investment you’d hoped for with your digital marketing campaigns, get in touch with us. We’d be happy to take a look at what you’re currently doing and help you find the most effective ways to improve your campaigns.